What is a CCRC (Continuing Care Retirement Community? A Continuing Care Retirement Community (often referred to as a CCRC) is part housing for residents, part cultural center and part healthcare provider. These combined services allow residents to live as independently as desired. A CCRC differs from other retirement options in that it provides a continuum of housing, services, and healthcare. A written agreement between the resident and the CCRC is generally intended to last the resident’s lifetime in a secure community environment. Non-profits are mission-driven, with their resources invested back into the community. Elim Park Place is a not-for-profit, interdenominational, nationally accredited continuing care retirement community (CCRC) located in the historic town of Cheshire, Connecticut. Designed to serve people 62 years and better, Elim Park has earned its outstanding reputation by adhering to and setting very high standards for quality health care, housing and services. Post-Acute Care and Rehabilitation Services are also available for adults of all ages in our Health Care Center. What makes a nonprofit CCRC special? Nonprofit CCRCs have a rich history of serving older adults, often with innovative approaches to managing the care of the people they serve. Nonprofit communities encourage residents to be as active and independent as possible. They also recognize that services should be tailored to individual needs and made available in a “continuum”—including choices in wellness programs, housing, support services, in-home care, and nursing and medical care. Assisted Living is a program that provides and/or arranges for the provision of daily meals, personal and other supportive services, health care and 24-hour oversight to persons living in a group residential facility who need assistance with activities of daily living. Click here for more information about Elim Park’s Residential Care Home. Assisted Living Services are available in your home, as needed, in Elim Park Place Independent Living apartments. What is Elim Park’s mission? Elim Park is a not-for-profit Continuing Care Retirement Community whose mission is to provide quality care through comprehensive wellness programs and medical facilities for our residents in a Christ-centered environment. Elim Park looks upon its mission as an extension of the Church ministry within the Baptist General Conference (now also known as Converge Northeast) and gives admission priority to its members. Residents are encouraged to grow spiritually as they live out their lives at a level of wellness and independence appropriate to their individual situation. Is Elim Park affiliated with any religious organization? Yes. Elim Park is endorsed by Converge Northeast (BGC). Our mission is to encourage spiritual growth in a variety of ways. In addition to providing regular religious services and special programs in our Chapel, we work to create the kind of environment where residents can find harmony in their everyday lives. Your first step is to call Elim Park and make an appointment with a representative. You can learn more about independent living here at Elim Park, and make an appointment to visit us, by contacting a Retirement Counselor at 203-272-7550, or toll-free at 800-994-1776, or emailing us at info@elimpark.org. What are the Independent Living apartments like? There are many different choices of one- and two-bedroom apartments, most with private balconies or patios. All apartments have a fully equipped modern kitchen with washer and dryer facilities. Click here to view our many floor plans and photos and explore your options. Will I have control over my own heating and air conditioning? Yes, each apartment has individually controlled heating and air conditioning. All utilities are included except personal telephone, cable television and internet access. Yes. We provide bi-weekly housekeeping services and handle all interior and exterior maintenance, including trash removal. Emergency repair service is available 24 hours a day, seven days a week. Can I own a car at Elim Park? Yes! Free parking is available near your apartment. Garages and underground parking are available for an additional fee. If I don’t own a car, how can I get around? Our transportation services will take you wherever you need to go in the area. At Elim Park we have a wide variety of options for your dining pleasure. Choose to make your own meals in your kitchen, or share meals with friends and community in all three of our full-service restaurants, the Conservatory, the Spring House Bistro and the Elim Park Baking Company. From soups, salads and omelets to sandwiches and complete entrees, you will be amazed each day with our culinary creations. Click here to view our sample seasonal menu. Are there meals on the menu for people with special diets? We offer a broad range of choices for residents who are looking for specific meals to meet specific dietary needs. We also have an on-site dietician who is available to help residents make appropriate choices based on their dietary needs. What accreditations does Elim Park have? Other affiliations? 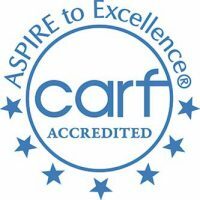 Elim Park is accredited by the Continuing Care Accreditation Commission (CCAC). Elim Park has also been a member of the Cheshire Chamber of Commerce since 1984. To learn more about Elim Park, or to make an appointment to visit us, please contact a Retirement Counselor at 203-272-7550, or call toll-free at 800-994-1776, or email us at info@elimpark.org.